Flyers General Manager Ron Hextall has some tough decisions to make…soon. His team seems dead in the water and is sinking fast in the Metropolitan Division standings. Though it is still early in the season, it is tough to see any signs that this team will look any different (i.e., better) anytime in the near future without some big changes. Unfortunately, Hextall’s choices are very limited as a result of bad decisions by his predecessor involving bad trades and costly, long-term contracts with players fast approaching the down side of their careers. As a result, Hextall has no cap space to sign new blood and little “trade bait” with which to obtain much needed help, especially on the blue line. It has been rumored that Hexall has been talking to other GMs for months trying to make a deal to help his ailing team, but thus far nothing has materialized. The reality is that to get value you have to give value. And the most valuable Flyers players (Voracek, Giroux and Simmonds, in my opinion) are too valuable to be traded. Why give up the best that you have for something similar or perhaps worse? And, I would imagine that Hextall is having trouble crafting viable trades involving just about everyone else. Of course Hextall could offer up one or more of the promising young defensemen-in-waiting in juniors and the AHL, but I shudder at the thought. Fortunately, Hextall has it made it clear that he values home-grown players and intends to develop them properly. That is why highly touted blue liners Robert Hagg, Samuel Morin, Shane Gostisbehere and Travis Sanheim are not with the Flyers right now. Heaven knows the team could use their help. But that’s not Hextall’s way. He is aware of the risk of ruining young players by rushing them to the NHL, and he has vowed that he will not do that under any circumstances. But, wow, this team is in pretty dire circumstances. Maybe it is time to give Hagg a shot? When the Flyers blue line was decimated by injury in late October, Hextall called up Ghostisbiere for several games. I was at his first NHL game and it was thrilling to see him play. Even though he is not as bulky as he probably needs to be to play full-time in the NHL, he showed flashes of pure skill and great on-ice decision making that you don’t see every day. But, to many fans’ dismay, Hextall decided that Ghost needed more time in the AHL. Ironically enough, he suffered a torn ACL within a few weeks of returning to the Phantoms. Though the surgery and related rehab is going well, he will not be back on the ice for several months. On the other hand, Morin seems physically ready to play in the NHL, but probably needs more time with his junior team to mature his game. He had an excellent training camp with the Flyers and hung around until the end of it, but ultimately was sent back to his junior team. Early in the season he suffered a broken jaw that kept him off the ice for over a month. He is playing again now but is technically untouchable by the Flyers until his junior season is over. My opinion is that as soon as these promising young defensemen are ready to play in the NHL, the Flyers will undergo an immediate major upgrade. The problem is: what does the team do in the meantime to stay afloat without sacrificing the future by giving up current prospects and future draft picks? I’m glad I don’t have Hextall’s job because I’m sure I wouldn’t be able to sleep at night. The man is facing tough decisions indeed. There has been a lot of focus by the NHL recently on trying to attract more female fans to the game. I applaud that the NHL acknowledges the female fan and wants more of them; however, I think that sometimes the NHL is misguided in its efforts. Maybe that is because there is no typical female hockey fan. And here’s why: In my experience as a female fan attending Philadelphia Flyers games, I see many female fans of all ages. And I imagine they are at the game for many different reasons. There was a time when “nice girls” didn’t attend hockey games. But these days (thank goodness), hockey has many female fans. In my case, I was a hockey fan long before I met my husband seven years ago, but he is responsible for turning me into a Flyers fan. But that said, I can fairly say that I am the bigger Flyers fan now. He is a fan for sure, but I am the one who drives the fandom bus so to speak. It is because of me that we travel from Northern Virginia to Philly for weekend Flyers games. And, I am the one who reads newspapers articles about the Flyers daily, keeps up with the team on social media, and watches every game on my tablet. And, I am sure there are many other female hockey fans who are just as passionate about the game as I am, if not more so. When I am at Flyers game I see many other female fans and speculate on what has brought them to a hockey game. I imagine that some are at the game because their male significant other is a big fan. These women may follow the team and know the game, but are there mainly because their significant other wants to go to the game. Along the same lines, I see young girls and teenagers who may be at a game as part of a night out with family or friends. I see a lot of young women at Flyers games. Many seem to be there with friends or boyfriends, and some seem to be what some people would call “puck bunnies.” But in any case, these women are at the game, wearing Flyers gear, and cheering the team on. Speaking of team apparel: In a recent trip through the Flyers merchandise store in Wells Fargo Center, I was happy to see many clothing items specifically made to fit women. The encouraging thing was that I saw very little pink. Instead, I saw many cute shirts and jerseys in classic styles, very similar to the merchandise marketed to men. While the NHL may be doing better when it comes to providing classic apparel for female fans, there are other areas that could seem to use a bit more tweaking. One example that comes to mind is the popular “Hockey in Heels” event that many teams offer. This event is marketed exclusively for women to introduce them to the game and help them understand it better. A friend of mine who is a Washington Capitals season ticket holder (and a very knowledgeable hockey fan) is planning to attend the Caps Hockey in Heels event this month. She said that it is a three-plus hour event and includes on-ice skills demonstrations by Caps players. That part of the event impressed me and is something that even a knowledgeable fan might enjoy. However, on the surface, this kind of event sounds patronizing to women. When I first heard about this event, my first thought was: How in the world does it take an entire evening to explain hockey. It’s not like it’s rocket science. I figured it out myself (and still learn new things every day) and so can everyone else. I think that the best way the NHL can market to women is to treat us just like they treat their male fans. We are all fans of the game and want the same kinds of things from the game experience. And, when I am at a game, I don’t want to be treated any differently than anyone else. Though there may not be a typical female hockey fan, when it comes right down to it, we are all typical when sitting in an arena cheering on our favorite team. My husband and I are die hard Philadelphia Flyers fans living in Northern Virginia. On Saturday we made our first trip of the 2014-15 season to Philly to see the Flyers play their second home game of the season. My husband came by his Flyers fandom naturally, having been born and bred north of Philly, living and breathing Philly sports since birth. He introduced me to Flyers hockey several years ago and I fell hard. I quickly learned that being a Philly sports fan means plenty of passion….and plenty of heartbreak. Philly hockey fans are incredibly knowledgeable and dedicated, but also happy to explain how empty the proverbial glass really is. While I try to remain positive about the Flyers and maintain my usual “glass half full” mentality, the bad news just seems to keep coming as things this season have picked up right where last season left off. The Flyers made the 2014 playoffs and went seven games in round one with the always strong New York Rangers, losing the series when they easily could have won. But it was amazing that they made the playoff at all after starting the season with a 1-7 record and getting a new coach after losing their first three games. Now here we were at the beginning of the 2014-15 season and the Flyers were 0-2 and getting ready to face a strong Montreal Canadiens team. I had been looking forward to this game for months. It had been a long, hockey-less summer (with the exception of the NHL Draft in Philly, which we attended), and I was thrilled that hockey was back. In our second year as partial season ticket holders, we had secured seats in the lower bowl of the arena and I was happy at the thought of watching the games from near-ice view after last season’s in-the-rafters seats. The game started out like a dream, with the Flyers dominating the Canadiens and scoring three unanswered goals by the end of the second period. New alternate captain Wayne Simmonds was on fire as usual, scoring two of those goals. But like the Flyers of last year, it all suddenly began to unravel. The weak Flyers defense caved as the Canadiens put on a shooting clinic at the goal in front of us. Flyers backup goal tender Ray Emery was having an amazing game full of many near-impossible saves, but even he couldn’t keep the puck out of the net with this kind of barrage and little help from the defense. In a flash the score was 3-2 with about seven minutes left in the game and it was time for us to leave to start the long drive back to Virginia. As we exited the arena, the Canadiens tied the game. It was probably a good thing that we left, because it was likely that the overly dramatic Canadiens fans sitting in front of us were now being berated by very angry Flyers fan. And, as fired up as I had been during the game, there was no guarantee that I would not have participated in such a scene. The situation looked bleak because the Flyers never do well in shootouts. And this one was no different. I looked at my phone in dismay as the score read 4-3 Canadiens. The one point earned by the Flyers for the tie was no consolation. I was so sad and angry. I said to my husband: “This is the only sports team I care anything about. I can’t take it. How do you blow a 3-0 lead in the third period at home? !” He responded that everyone was saying this was a throw-away year (as the Flyers wait for their corps of young, talented defensemen to be ready to play in the NHL). My response was: “Well that doesn’t give you the excuse to blow a three-goal lead!” I took a deep breath and reminded myself that it was still October. There was so much hockey left. Plenty of time for the Flyers to turn it around and start winning….and plenty of time for them to keep breaking my heart. But I keep believing in the former…because that’s what being a fan is all about. Let me preface this post by saying that I am huge hockey fan. I love the sport and never grow tired of it. But why is NHL hockey still being played in the middle of June? On the East Coast, summer is in full force and most people are thinking about swimming in a pool of cool water on a hot, sunny day, not bundling up to go inside an arena and watch a game played on ice. I am enjoying watching the Stanley Cup finals (Go Kings!) and maybe I would feel differently if my Flyers were still playing right now, but I am ready for this season to be over. Let’s crown the Cup champion, get ready for the upcoming draft, then start getting excited about next season (which begins in a mere three months). My theory is that the NHL does not understand the concept of “too much of a good thing.” Take the Winter Classic as an example. Playing an NHL game in the middle of winter on an outdoor rink in a football or baseball stadium was a brilliant idea. And it was special….when there was only one Winter Classic game per season. I was at the WC in Citizens Bank Park in Philly on January 2, 2012. It was an amazing experience at such a festive time of year. Now, I imagine that most fans barely blinked an eye as the NHL played five outdoor games during the 2013-14 season: one Winter Classic game and four games during the Stadium Series. My feeling is that too many outdoor games take away the novelty and make the games seem ordinary, unlike those first WC games that seemed so magical. When if comes to the Stanley Cup playoffs, I have no problem with the number of teams that make the playoffs. I say, keep the number of playoff rounds the same, but make the playoff series best-of-five instead of best-of-seven. Other sports leagues (such as the NFL) have one-game playoffs, so does the NHL really need best-of-seven playoff series? I am not claiming to have done any kind of real math here, but I would imagine that best-of-five instead of best-of-seven series would knock at least a few weeks off of the playoffs, having them perhaps end before the official beginning of summer. But no matter how logical it seems (at least to me) that a shorter NHL season would be a better NHL season, I know that this will never happen because of one thing: $$$. The NHL knows that it has probably the most passionate and loyal fans in professional sports. We may not be as numerous as NFL fans, but we love our teams, know our sport well, and are willing to pay lots of bucks to attend games and buy merchandise…over and over again. I heard that some NHL fans discussed boycotting the first few NHL games played after the 2012-13 lockout was over, but I did not see evidence that attendance suffered at any of those first NHL games in 2013. Why? Because we are die hard fans of the sport no matter what and were out of our minds without hockey and could not wait to see the NHL play again. I know that I would not have agreed to boycott that first Flyers game that year. The Stanley Cup playoffs are amazing and one-of-a-kind. The level of play and intensity could not be higher, and it seems (at least this year) that the team matchups have been very good and even. 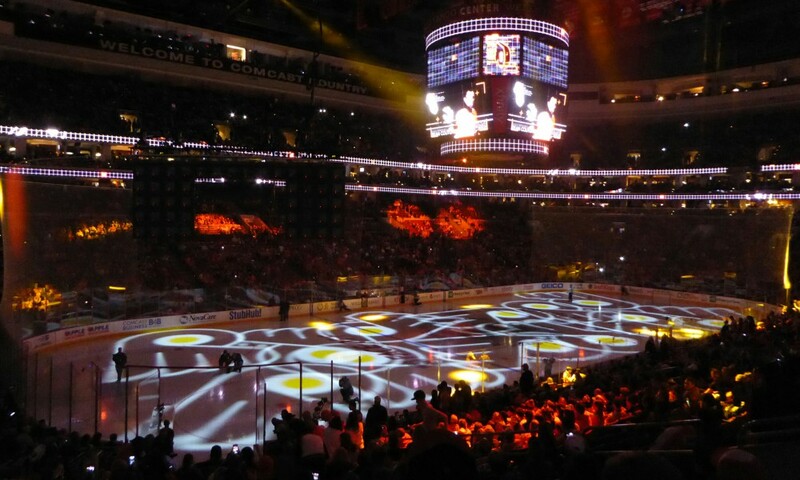 I was at Game 3 (the Flyers’ first home game) of the Flyers/Rangers series this past April. It was my first playoff game and it was an amazing experience after having supported the Flyers all season, wondering if they would even make the playoffs after their disappointing start to the season. The Flyers lost that playoff game (and went on to lose the series), but it was a night to remember. I have never heard Wells Fargo Center that loud….or seen it that orange. But it seemed weird to be going to a hockey game on a sunny, 70-degree day. And now it seems even more strange that the playoffs continue almost two months later. I hope that the Kings take it in four so that I can focus on attending the draft and getting hyped up about the 2014-15 NHL season.